Last time I had a leak dealer refused to plug it. New tire was about $600. OK, that leak was a gusher. This time, for the right front tire, If I left the car sitting for two months the tire would lose half the air. 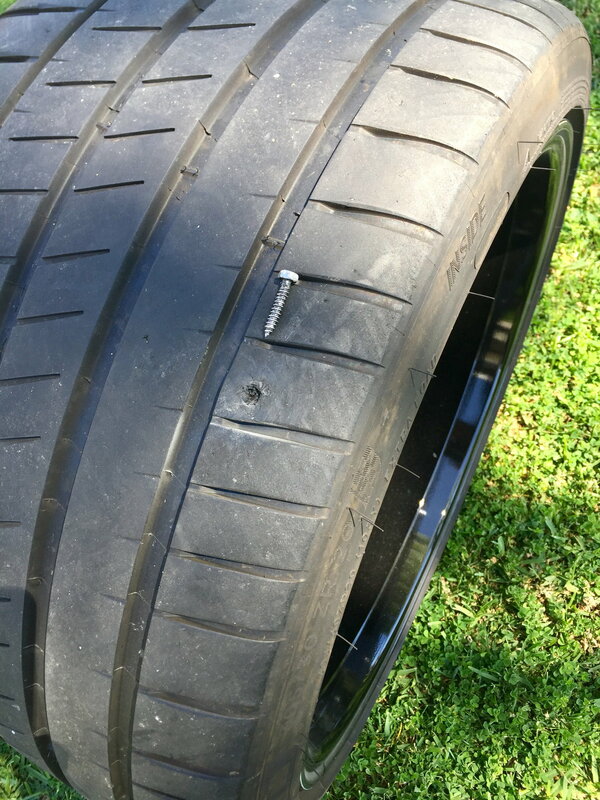 My local independent caught a tiny nail (without removing the wheel from the car) and plugged it with some kind of vulcanizing plug, which will eventually melt into the tire rubber. They say these plugs have never failed. Thank god for independent shops! @OP - Curious if the indie used the proper jack points and was any kind of puck used to cushion? or do you carry puck type thing in the car? I watched them try to use their lift and it was obvious there would be a problem, so they used a portable jack only at the front wheel, high enough to spin the tire for inspection. Pick up a cheap (~$55) set of custom pucks from a Rennlister that makes them and throw them in the frunk so they are with the car if you, or a shop, needs them. I had the same plug put on my tow vehicle tire after picking up a nail and enduring the 3 month slow leak. That was 20k miles ago and the tire is rock solid. The proper procedure is a plug and vulcanized patch. I would not do this on a P Car tire cause I tend to drive a fair amount on the track, but on a regular drive, absolutely. This past weekend I discovered a slow leak in my left rear tire. I also have a two year road hazard policy which covers repairs and/or full replacement. 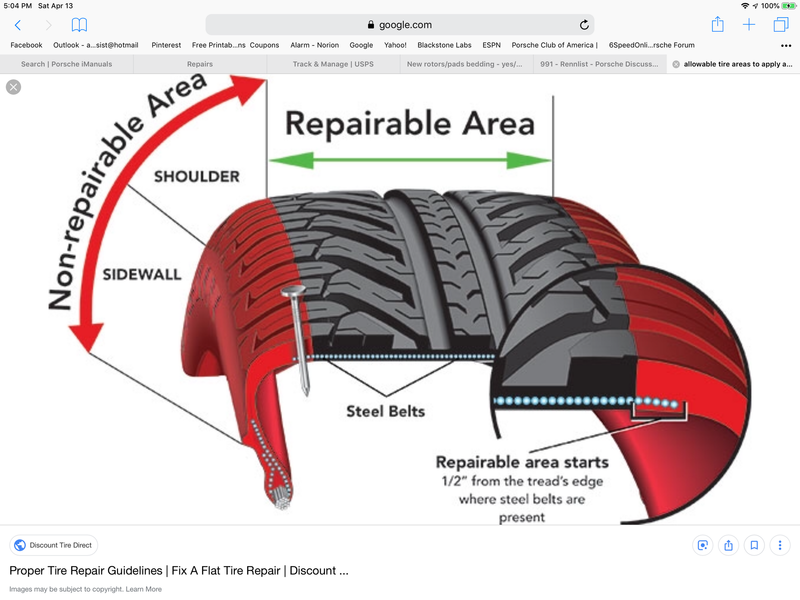 I conducted some research to determine when a tire is considered “unrepairable.” I found most searches have very similar guidelines (see attachment) and I also used the recommendations of my Indy Shop. I realize Porsche WILL NOT patch a tire and since I don’t track my vehicle I was fortunate my tire was repairable. My tire was plugged with a “Patch Plug” and the process involved several steps to prep the area to accept the patch. 1.) Locate and mark/highlight area requiring patch. 2.) Pre Clean the area with Rubber Prep. 4.) Clean out puncture with proper drill bit specialized to match plug/patch. 6.) Apply Contact Cement and let it air dry. 7.) 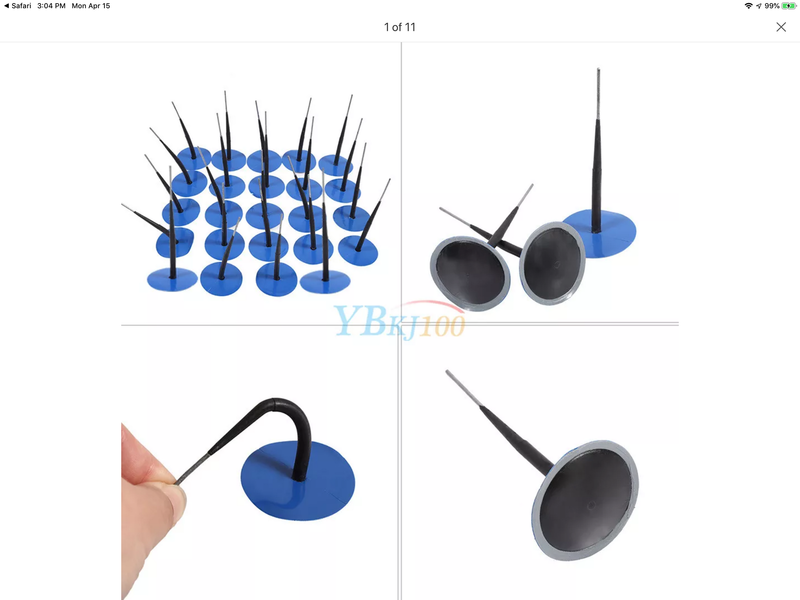 Apply patch and use specialized tool (Stitching Tool) to properly bond patch to tire. 8.) Remove thin plastic layer from patch. 9.) Apply vulcanizing cement over patch. 10.) Cut Pigtail leveled with tire thread. I also have a two year road hazard policy which covers repairs and/or full replacement. Curious why you chose to repair when your hazard policy (which I presume you paid for) may have paid for full replacement. You are partially correct. Tire Rack’s road hazard policy states A or B; repairable or non-repairable. It’s not my choice, the tech makes the call. Now, if I took the tire to a dealership the outcome would have been a new tire because they don’t repair tires. I could have pushed for a new tire, and I still have the option to move in that direction if the patch fails. I agree. My tech said exactly the same thing and stated a patch will work. Since I don’t track my car or drive at triple digits I’m okay with a patch providing it holds air. That would not work for me...I hit triple digits every time I take the car out.